The Shannon River gives Ireland’s central reaches their character. 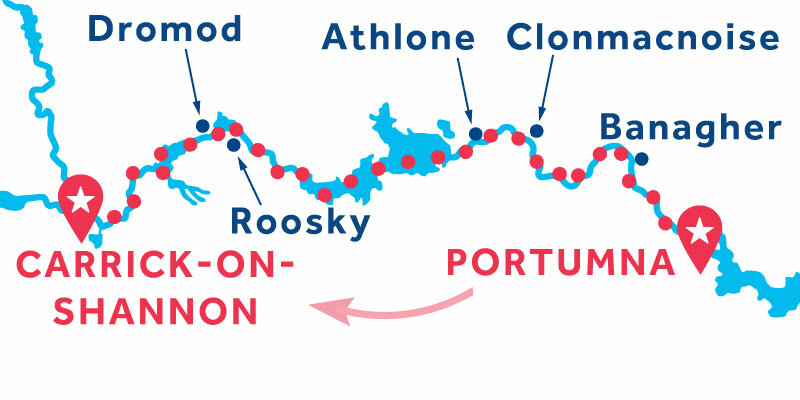 It’s an obvious feature if you study a Shannon River map. At a glance, it’s clear that the waters influence the land. The fishing is superb, and golf is a passion! The towpath is level, so you’re in cycling heaven! As you travel, you’ll stop in villages, explore medieval churches, and kick back in the pubs! Golfing vacations are a passion on the Shannon-Erne! Choose from six world-class golf courses and include golf breaks in your Shannon-Erne cruises! Tee off at the 18-hole golf course at the Slieve Russell Hotel in Ballyconnell! Then relax with a pint at the 19th hole! The Shannon-Erne is perfect for fishing vacations! Go for pike, perch, roach, bream and rudd. The Lower Lough Erne is famous for its hefty brown trout, and Upper Lough Erne is a pike angler's nirvana! Carrick-on-Shannon ranks as one of Ireland's top coarse fishing centres! Monastery ruins, medieval churches and stately castles are seen around every corner on the Shannon-Erne history vacations! Let the ruins of Clonmacnoise (circa 6th century) impress you! 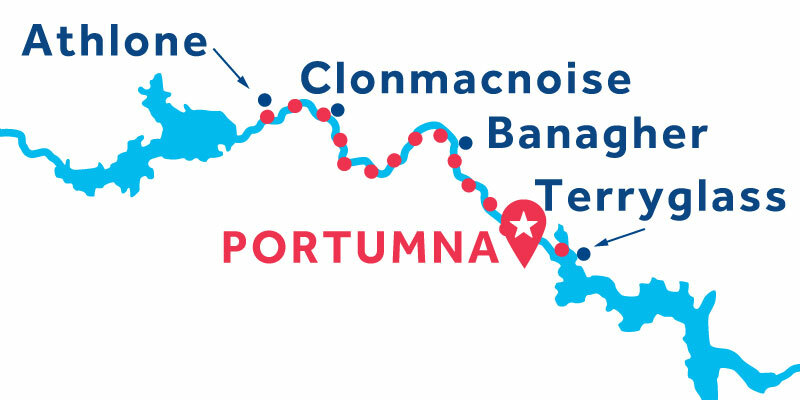 Not to be missed are the Brian Boru Heritage Centre, Portumna Castle and the Carrigglas Manor! The Irish coast rises tallish from the sea, and yet the terrain drops farther inland, creating a sort of cup where all the water goes. 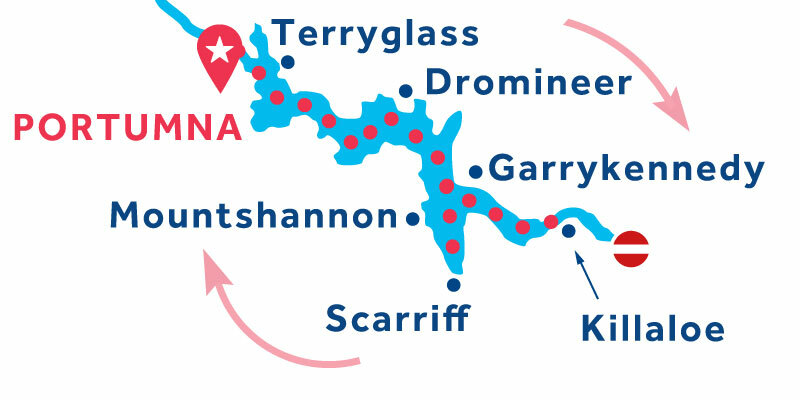 One fifth of the land drains inward to the Shannon River, Ireland’s largest at 360 kilometres (224 miles). The fall on the navigable middle section of the river is slight at only 9 metres (29 feet), which means the water moves slowly. 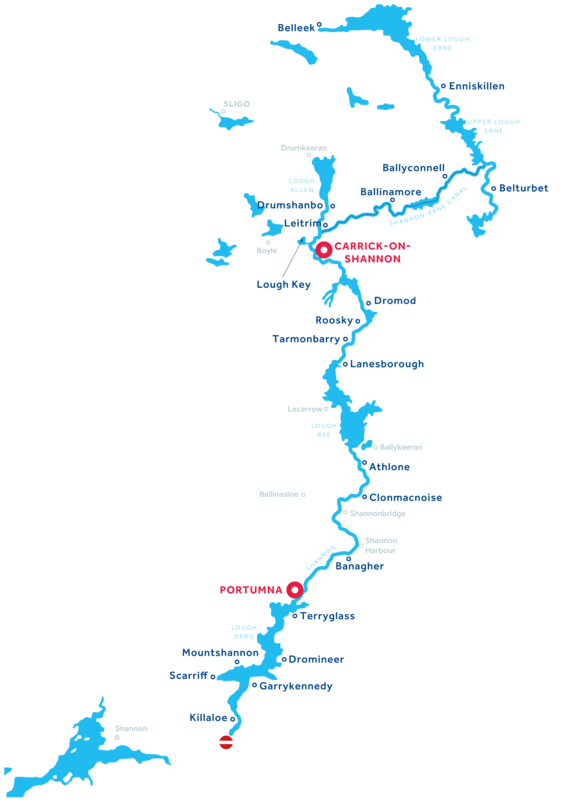 A Shannon River map also reveals the large number of lakes in the Shannon system, a real plus for canal boat cruising! 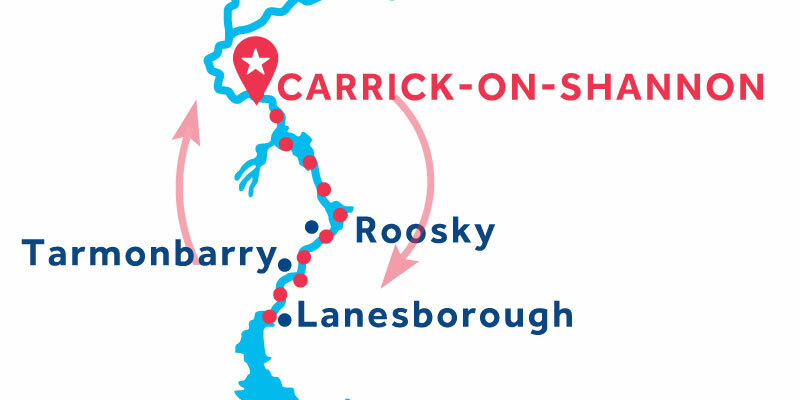 Taking a look at a Shannon-Erne waterway map turns up the pretty stretch of the Shannon-Erne Canal. 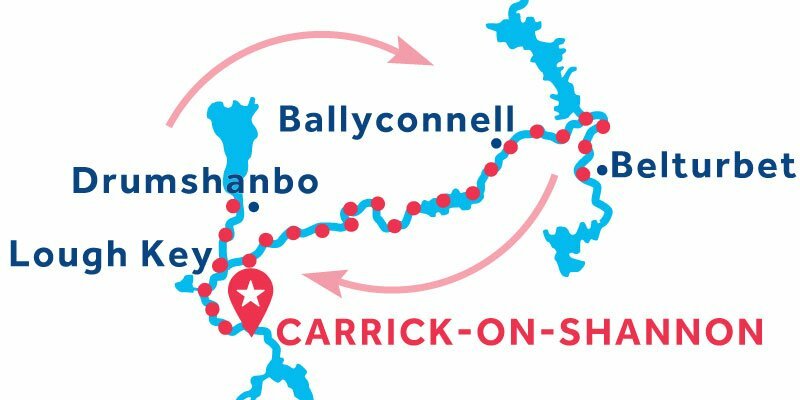 This passage links up the two canal systems of the Shannon and Erne rivers, thus accounting for its rather uncreative name. 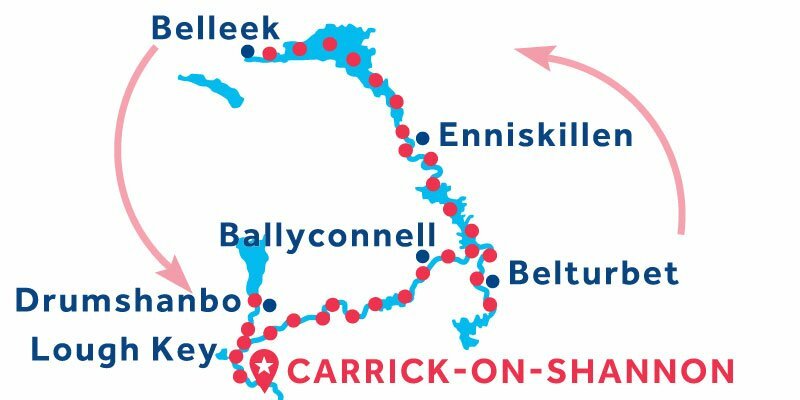 The canal is 63 kilometres (39 miles) and runs from Leitrim Village to Upper Lough. It has 18 locks and is delightfully pretty. 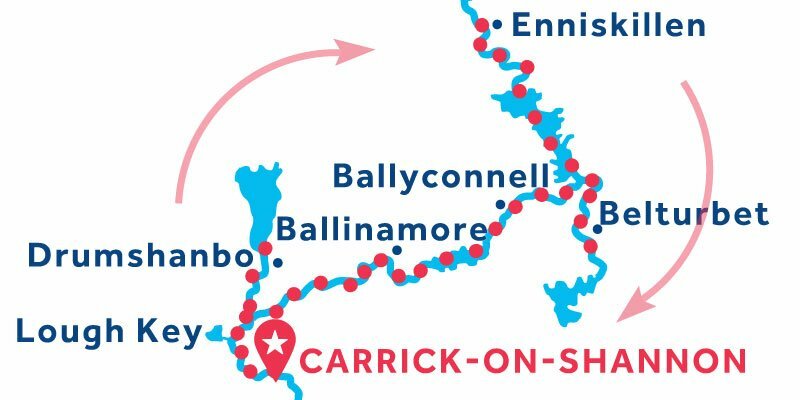 There is a lock fee of € 1.50 on the Shannon and €1.50 for a lifting bridge, Shannon erne canal has new system you can buy a 10 unit lock card for €6.35 and 1 unit per lock. Lifejackets must be worn in the locks. Opening hours: Locks are open daily 09:00-20:00 (8:00 p.m.). Public holidays: Locks are closed on some public holidays. 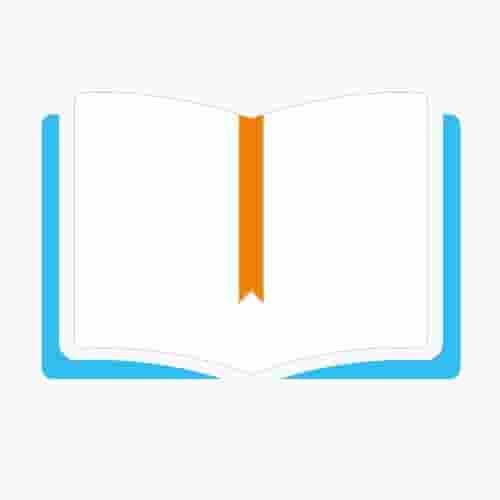 Ballinamore is a green and peaceful town with many activities on offer. 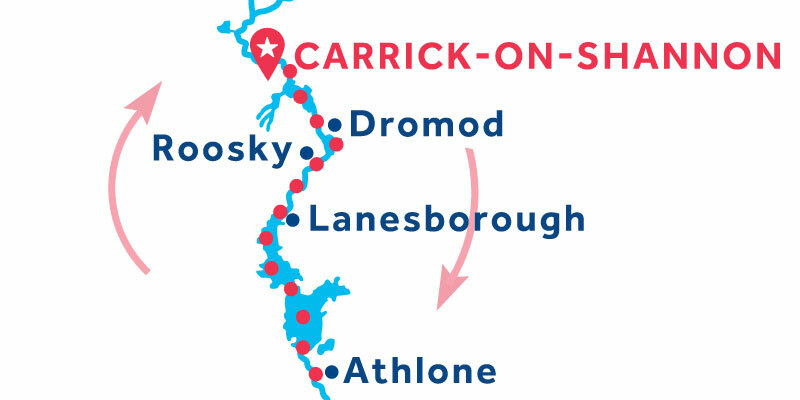 Walk the hiking paths around the city, take to your bicycle or visit the equestrian center..
Carrick-On-Shannon is the largest town in County Leitrim. The ruins of the old Carrick Castle can be glimpsed on the Carrick Bridge. Stop in this pretty town and visit the great Saint-Mary's Church. Learn its history and discover its culture in the art center. I would recommend, certainly, and we will travel again. However, please, this is Ireland. We are not Britain or the UK so stop sending information in Sterling. It is nonsense to do so since it is not the currency of the Republic. Smooth service and friendly staff at Carrick have always been an additional bonus.